Department of Mathematics, Faculty of Electronics and Physical Sciences, University of Surrey, Guildford GU2 7XH. My main interests are in using mathematics to understand the behaviour of various physical, biological and sociological systems. My background is in the study of dynamical systems using ideas from bifurcation theory. This has included studying pattern formation in problems with particular symmetries and the study of mechanisms that lead to either chaos or spatio-temporal chaos. Modelling changes in sleep timing and duration across the lifespan: Changes in circadian rhythmicity or sleep homeostasis? 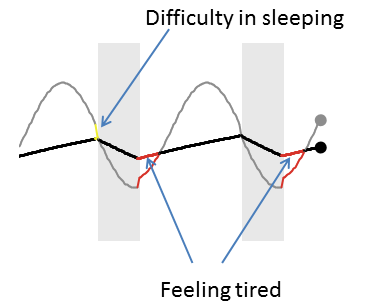 Mathematical models for sleep-wake dynamics: Comparison of the two-process model and a mutual inhibition neuronal model. Some further papers on the underlying mathematical structure of sleep-wake models are listed on my publications page. Downloadable software that explores sleep-wake regulation is available here. I am a co-investigator on the Evolution and Resilience of Industrial Ecosystems project, ERIE . The dynamics of the carbon cycle of an evergreen forest. (Collaborators: Anna Chuter, Philip Aston). Modelling novel spiralling carbon nanostructures. (Collaborators: David Lloyd, Hidetsuga Shiozawa, Vlad Stolojan, David Cox and Ravi Silva). Analysing models of population dynamics including delay. (Collaborator: Nicholas Robertson). Regular patterns are seen in a wide variety of physical, chemical and biological systems. The tools of symmetry and bifurcation theory can be used to determined some of the generic features of such patterns and which ones are most likely to be observed. One of the focusses of my research is the study of superlattice patterns, initially from the point of view of understanding the generic bifurcation problem and more latterly applying these results to specific physical problems. Some examples of superlattice patterns are shown to the right. One problem of particular interest is understanding the huge variety of patterns that arise in the Faraday crispation experiment. In this experiment a container of fluid is shaken up and down. Depending on the frequency and amplitude of the shaking different patterns are observed. My current research on this problem includes work with Alastair Rucklidge and Mary Silber on a mechanism for the development of spatio-temporal chaos. Many mathematical studies of patterns assume that the domain is infinite. In practice, experiments are necessarily finite and boundaries can have an influence on the patterns that are observed. Some of my past research has included examining how boundaries can influence the patterns that are observed in convection problems. Since the discovery of chaotic phenomena, it is well-known that simple systems of ordinary differential equations can display extremely complex dynamics. In my thesis I examined one such simple system, a system of parametrically excited coupled pendulums, in order to investigate the routes to chaos. Geological evidence tells us that the magnetic field within the Earth has intermittently changed its direction, with magnetic North becoming South and vice versa. With Raymond Hide and David Acheson I investigated simple models of geodynamos to illustrate this phenomena.